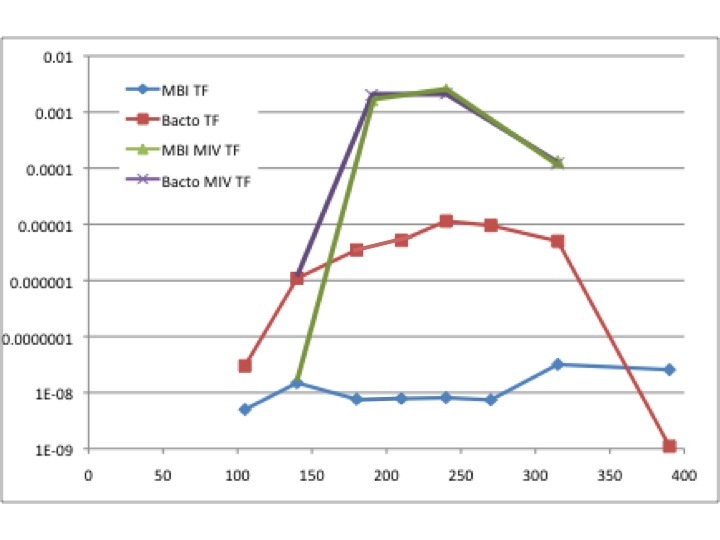 I've recently discovered that our H. influenzae cells are not growing well in our standard brain-heart infusion medium (sold by the now-defunct MBP); they grow better in the standard Bacto brand. But there's been a lot of variability (day-to-day, batch-to-batch) in growth, and even when I've done semi-controlled tests. So this week I did a very carefully controlled test. I made fresh batches of both media, meticulously rewashing the bottles to be sure they had no soap residue. I inoculated both cultures with exactly the same volume of cells from the same frozen tube. Then I followed growth, both by OD600 and by cfu/ml, and followed competence by incubating aliquots with transforming DNA and then plating on selective plates. I also transferred 10 ml of each culture into the starvation medium MIV to induce maximal competence. 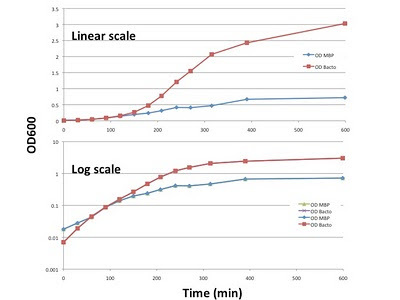 The first pair of graphs show OD600, on linear and log scales, and the next graph shows cfu/ml. Both cultures initially grew at the same rate, by OD measurements. Time 'zero' on the graph is 2 hr after the cells were first inoculated, and at this time the cells in MBP medium were actually slightly more dense than those in Bacto medium, indicating that the two cultures had been growing at the same rate. 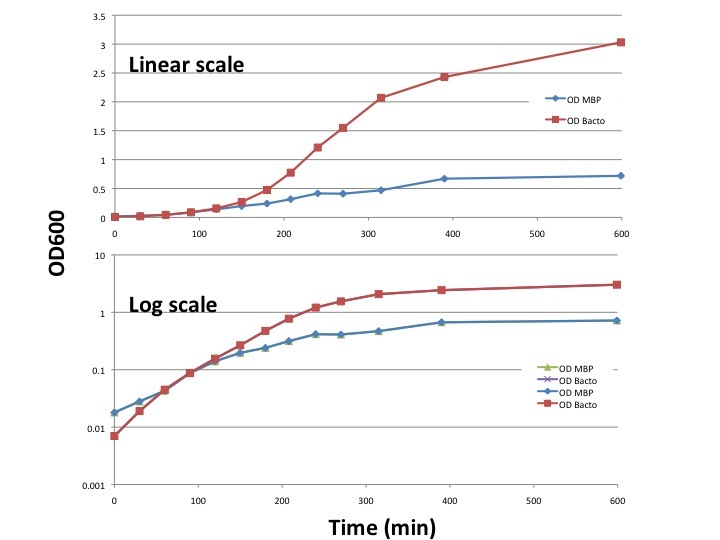 But the cells in the MBP medium were already beginning to grow more slowly, and they soon slowed way down and leveled off at a density about 5-fold lower than the cells in Bacto medium. (The '600 min' time point is really after about 1300 min (overnight growth), but that wouldn't fit nicely on the graph.) The cfu graph also shows expected cessation of growth after the cells were transferred to MIV. Now here's the graph of transformation frequencies. 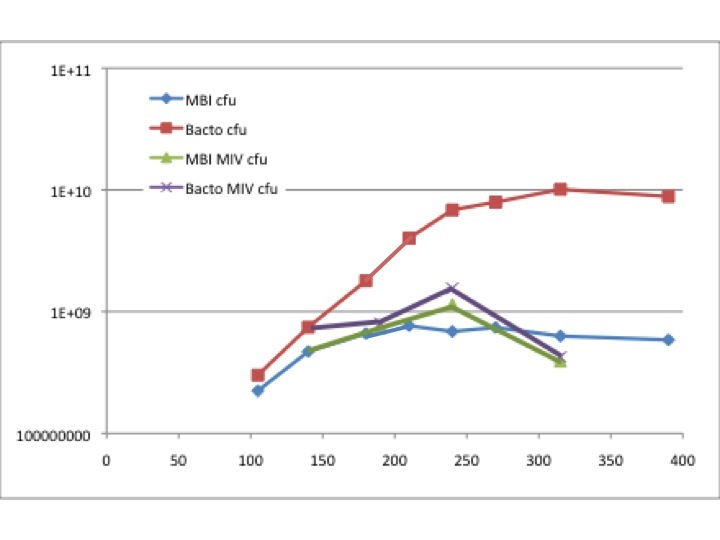 Cells in Bacto medium became reasonably competent when the couture got dense, but the cells in MBP medium never became competent at all. (This tells us that whatever causes growth to stop early in MBP isn't the same factor that causes competence to develop when cells reach high density.) The cells that were transferred to MIV from either medium became equally competent. What makes a good defined medium?